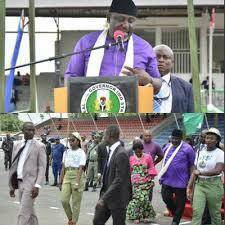 Governor Rochas Okorocha placed a smile on the faces of the 1,542 Corps members who passed out on Wednesday, 12th April in IMO State, by awarding each of them with the sum of N10,000 to enable them transport themselves back to their respective states. He Further singled out one Miss Umetawara Lorita Ebere, who was the best serving corper of the state and entitled her to a sum of N200,000 and a Job in any Ministry of her choice if she decides to stay. The Governor also encouraged them to go out and empower themselves with the knowledge they have gained from their various institutions and become their own bosses instead of waiting for white collar jobs, he also thanked them for serving the state well.